For a man who once commanded huge organizations and made decisions affecting the lives of millions, Robert S. McNamara (MBA 39) is mostly on his own these days. Dressed casually in khakis and a button-down shirt, he operates out of a single cluttered office in a building not far from the White House. To the young receptionist who buzzes in a visitor, hes Mr. Mac, best known, perhaps, as the restless, elderly gentleman down the hall. To those of an older generation, he is, of course, much more than that: one of the most prominent  and controversial  Americans of the second half of the 20th century. But regardless of how history may judge his record, McNamaras decades of service in the public and private sectors enable him to speak with singular authority about the strengths and shortcomings of American management and leadership. At 88, McNamara is energetic and vigorous. His gaze is intense, and the legendary steel-trap mind is still in evidence. My HBS experience was a major event in my life, he eagerly volunteers, gripping his visitors hand. 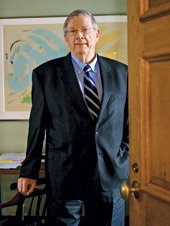 It opened my eyes to the role of business and business management in our society. An economics major at the University of California at Berkeley, McNamara discovered at HBS a field of specialization he would make his own and use to change three institutions and, arguably, the United States, writes journalist Deborah Shapley, a McNamara biographer. That field was financial control; as taught by Professor Ross Graham Walker and others, a companys numbers had value far beyond mere record-keeping. Statistical data could instead be used proactively as a general management tool for analyzing an organizations production and operations and measuring the efficacy of problem-solving initiatives. McNamaras dedication to this approach would later prove a double-edged sword, carving out considerable successes as well as disturbing failures, in the view of many observers. Better numbers, employed imaginatively, might boost car sales, critics agreed, but could they truly indicate a wars progress? In matters of the human spirit, numbers could be deceiving. Hired as a whiz kid at Ford Motor Company, McNamara climbed the corporate ladder and, after fourteen years, was named president (the first from outside the Ford family) in November 1960. Bucking sacrosanct industry notions, he promoted vehicle safety and seat belts, warned that foreign automakers would one day produce cheaper and better-quality cars than Detroit, and insisted that American consumers would buy small cars. Implementing that heretical idea, McNamara successfully introduced the compact Ford Falcon and even planned to produce a Volkswagen competitor (a project killed after he departed Ford). The fact that a major industrys conventional wisdom could go unchallenged for so long, and eventually prove to be so misguided, was striking to McNamara. It exposed a serious flaw in organizational and management systems, both public and private, that he would repeatedly observe (and, admittedly, sometimes be a part of) throughout his career. Only weeks after being named Ford president, McNamara was tapped by the newly elected Kennedy administration to be Secretary of Defense. The early years at the Pentagon were among the best of his career: It was a time when his professional persona, that of rigorous enforcer of management-science principles, could coexist with a more personable side, softened by the glow of Camelot. Decisions and policies had to be made regarding history-shaping issues such as the nuclear arms race, the Cold War, and the Cuban missile crisis. There was the shock of the Kennedy assassination and the accession of President Johnson. And increasingly, there was the problem of Southeast Asia. McNamara says he at first accepted the Cold Warbased domino theory that if South Vietnam fell to communism, other countries in the region would fall in turn. In recent years, most publicly in the 2003 documentary film The Fog of War, he has admitted that he was mistaken about that. Now, as the man who oversaw much of the Vietnam Wars escalation before becoming, unbeknownst to the public, its strongest opponent inside governments upper reaches, McNamara is asked the inevitable question: Is Iraq in 2004 another Vietnam? Despite his eventual, lonely opposition (now hailed as courageous by many observers) to the Vietnam War inside the Johnson administration, McNamara could not turn the tide. In 1968, the same year he was selected as the inaugural recipient of HBSs newly established Alumni Achievement Award, McNamara left the Pentagon. He chose not to make public his opposition to the war, but immersed himself in his new duties as president of the World Bank, a post he would hold for thirteen years. Focusing on Third World development, he enlarged the Banks staff and loan portfolio, boosted infrastructure projects, promoted agricultures green revolution, and emphasized poverty reduction.